The St. Patrick’s Parade Society is pleased to bring an Irish music icon to Toronto for the first time! 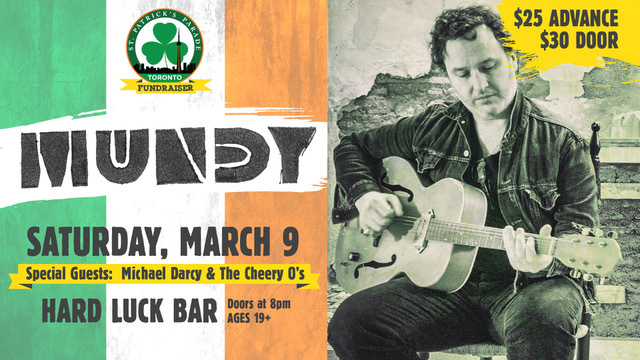 Don’t miss Mundy’s solo acoustic appearance on Saturday, March 9, 2019, at the Hard Luck Bar. He’ll be playing all your favourite songs like Galway Girl, July, Mexico and more. Tickets won’t last long so get yours today! Early Bird Tickets are $20 until Friday, February 15. Regular priced tickets are $25 until 3:00 pm on the day of the show (while quantities last). Door tickets are $30. Cash only at the door! Doors open at 8:00 pm with local openers, The Cheery O’s (8:30pm) and Michael Darcy (9:15pm) kicking off the night. Mundy will take the stage at 10:00pm. All sales are final. Attendance is restricted to ages 19+. Government issued, photo ID is required for entry. Lineup and set times may change at the discretion of the promoter.